Arctic explorer, author, journalist, anthropologist. Lorenz Peter Elfred Freuchen (February 2, 1886 – September 2, 1957) was a Danish explorer, author, journalist and anthropologist. He is notable for his role in Arctic exploration, especially the Thule Expeditions. Freuchen was married three times. He was first married in 1911 to Navarana Mequpaluk (d. 1921), an Inuit woman who died in the Spanish Flu epidemic after bearing two children (a boy named Mequsaq Avataq Igimaqssusuktoranguapaluk (1916 - c. 1962) and a girl named Pipaluk Jette Tukuminguaq Kasaluk Palika Hager (1918–1999)). His second marriage was to Magdalene Vang Lauridsen (1881–1960), daughter of Johannes Peter Lauridsen (1847-1920), Danish businessman and director of Danmarks Nationalbank. The marriage started in 1924 and was dissolved in 1944. In 1945, he married Danish fashion illustrator, Dagmar Cohn (1907–1991). Freuchen's grandson, Peter Ittinuar, was the first Inuk in Canada to be elected as an MP, and represented the electoral district of Nunatsiaq in the House of Commons of Canada from 1979 to 1984. From 1926 to 1940, Freuchen owned the Danish island Enehoje on Nakskov Fjord. During this period he wrote several books and articles and entertained guests. Since 2000, the uninhabited island has been a part of Nakskov Vildtreservat, a wildlife reserve. In 1906, he went on his first expedition to Greenland as a member of the Denmark expedition. Between 1910 and 1924, he undertook several expeditions, often with the noted Polar explorer Knud Rasmussen. He worked with Rasmussen in crossing the Greenland ice sheet. He spent many years in Thule, Greenland, living with the Polar Inuit. In 1935, Freuchen visited South Africa, and by the end of the decade, he had travelled to Siberia. In 1910, Knud Rasmussen and Peter Freuchen established the Thule Trading Station at Cape York (Uummannaq), Greenland, as a trading base. The name Thule was chosen because it was the most northerly trading post in the world, literally the "Ultima Thule". Thule Trading Station became the home base for a series of seven expeditions, known as the Thule Expeditions, between 1912 and 1933. The First Thule Expedition (1912, Rasmussen and Freuchen) aimed to test Robert Peary's claim that a channel divided Peary Land from Greenland. They proved this was not the case in a 1,000 km (620 mi) journey across the inland ice that almost killed them. Clements Markham, president of the Royal Geographical Society, called the journey the "finest ever performed by dogs." Freuchen wrote personal accounts of this journey (and others) in Vagrant Viking (1953) and I Sailed with Rasmussen (1958). He states in Vagrant Viking that only one other dogsled trip across Greenland was ever successful. When he got stuck under an avalanche, he used his own feces to fashion a dagger with which he freed himself. While in Denmark, Freuchen and Rasmussen held a series of lectures about their expeditions and the Inuit culture. Freuchen's first wife, Mekupaluk, who took the name Navarana, accompanied him on several expeditions. When she died he wanted her buried in the old church graveyard in Upernavik. The church refused to perform the burial, because Navarana was not baptized, so Freuchen buried her himself. Knud Rasmussen later used the name Navarana for the lead role in the movie Palos Brudefærd which was filmed in East Greenland in 1933. Freuchen strongly criticized the Christian church which sent missionaries among the Inuit without understanding their culture and traditions. When Freuchen returned to Denmark in the 1920s he joined the Social Democrats and contributed with articles in the newspaper Politiken. From 1926 to 1932 he served as the editor-in-chief of a magazine, Ude og Hjemme, owned by the family of his second wife. He was also the leader of a movie company. In 1932 Freuchen returned to Greenland. This time the expedition was financed by the American Metro-Goldwyn-Mayer film-studios. He was also employed by the film industry as a consultant and scriptwriter, specializing in Arctic-related scripts, most notably MGM's Oscar-winning Eskimo/Mala The Magnificent starring Ray Mala, and featuring Freuchen as Ship Captain. In 1956, he won $64,000 on The $64,000 Question, an American TV quiz-show on the subject "The Seven Seas". In 1938 he founded The Adventurer's Club (Danish: Eventyrernes Klub), which still exists. They later honored his memory by planting an oak tree and creating an Eskimo cairn near the place where he left Denmark for Greenland in 1906. It is situated east of Langeliniebroen in central Copenhagen and not far from the statue of The Little Mermaid. During World War II, Freuchen was actively involved with the Danish resistance movement against the occupation by Nazi Germany, despite having lost a leg to frostbite in 1926. He openly claimed to be Jewish whenever he witnessed anti-semitism. Freuchen was imprisoned by the Germans, and was sentenced to death, but he managed to escape and flee to Sweden. 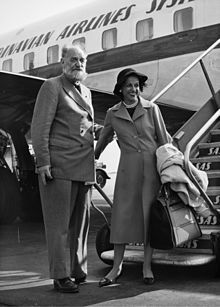 In 1945 he married Danish-Jewish designer Dagmar Freuchen-Gale. As he related in Vagrant Viking, he was friends with the royal families of Scandinavia and other countries, and his movie work in New York City and Hollywood brought him into the 'royalty' of moving pictures and the political world of Washington, D.C.
Freuchen and his wife Dagmar lived in New York City, and maintained a second home in Noank, Connecticut. The preface of his last work, Book of the Seven Seas, is dated August 30, 1957 in Noank. He died of a heart attack three days later at the Elmendorf Air Force Base in Anchorage, Alaska. After his death, his ashes were scattered on the famous table-shaped Mount Dundas outside of Thule. Freuchen Land in Greenland was named after him. "Arctic Adventure: My Life in the Frozen North", Farrar & Rinehart, New York, Toronto, Copyright 1935. "Peter Freuchen's Book of the Seven Seas", Julian Messner, Inc., New York, Copyright 1957. 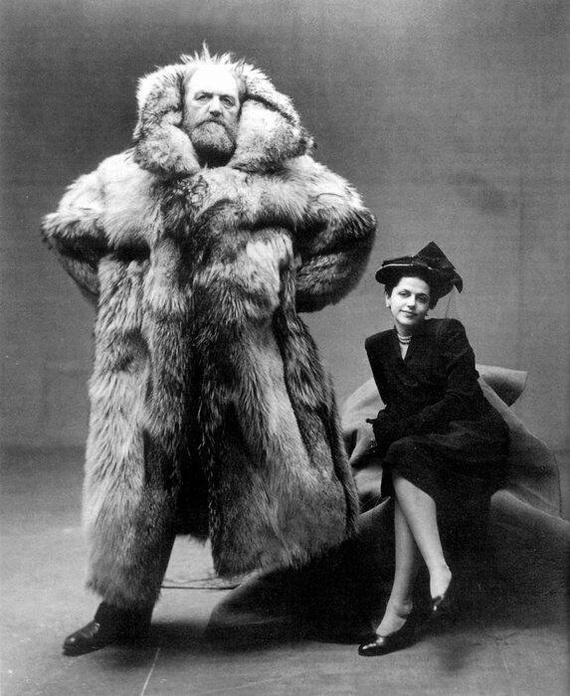 ^ "Husband: Peter Freuchen". December 26, 2008. Retrieved 2009-03-09. ^ a b "Vagrant Viking". Time. time.com. April 7, 1958. ^ "Dagmar Freuchen-Gale; Artist and Illustrator". The New York Times. March 22, 1991. Retrieved June 1, 2017. ^ "Peter Ittinuar". Canadian Confederation. Archived from the original on May 4, 2007. Retrieved June 1, 2017. ^ "Big Dane Tamed". Time. July 4, 1938. ^ "Nakskov". Naturstyrelsen. Retrieved June 1, 2017. ^ a b Liukkonen, Petri. "Peter Freuchen". Books and Writers (kirjasto.sci.fi). Finland: Kuusankoski Public Library. Archived from the original on 28 February 2009. ^ Sam Alley. "Knud Johan Victor Rasmussen". Minnesota State University. Archived from the original on October 12, 2010. Retrieved June 1, 2017. ^ Knud Rasmussen, 1927, Across Arctic America, Introduction. ^ "Ude og Hjemme fejrer 50 års fødselsdag". Ude og Hjemme (in Danish). 17 January 2013. Retrieved 6 May 2015. ^ a b Freuchen, Peter; David Goldsmith Loth; George Plimpton (2003). Peter Freuchen's Book of the Seven Seas. Globe Pequot. pp. 11–12. ISBN 1-59228-125-7. ^ "Royal Danish Geographical Company Hans Egede Medal". Archived from the original on 2017-02-10. Retrieved 2018-01-09. ^ Niels Jensen. "Sophus Michaëlis' Legat". Dansk litteraturpriser. Retrieved June 1, 2017. ^ Niels Jensen. "Herman Bangs Mindelegat". Dansk litteraturpriser. Retrieved June 1, 2017. ^ Niels Jensen. "Kaptajn H.C. Lundgreens Legat". Dansk litteraturpriser. Retrieved June 1, 2017. This page was last edited on 2 March 2019, at 09:49 (UTC).